Published: Jan. 8, 2014 at 12:22 p.m. Updated: Jan. 8, 2014 at 08:32 p.m.
After scattering Gary Kubiak's assistants to the wind, new Texans coach Bill O'Brien has begun the process of building out his coaching staff in Houston. 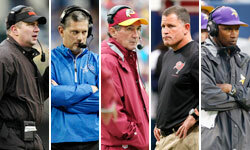 NFL Media Insider Ian Rapoport reported that O'Brien met Wednesday with Romeo Crennel to discuss the defensive coordinator role left vacant by Wade Phillips. A source who's spoken with Crennel said it won't be his only coaching opportunity. Rapoport also dropped an interesting nugget: O'Brien and Crennel have never met. They never coached together in New England, but it was widely assumed the pair at least crossed paths as well-known understudies of Bill Belichick. Crennel still looms as an obvious fit in Houston after earning his keep with a 3-4 philosophy that would allow J.J. Watt and Brian Cushing to continue in the scheme they've excelled in since entering the league. Even if Crennel takes the Texans gig, he's still on schedule to coach the East-West Shrine Game later this month against former Houston Oilers and Atlanta Falcons coach Jerry Glanville. Sure sounds like that won't be Romeo's last gig.